Noble Bird looks compact but well put together. Does anyone know how tall he is? Is Bird Song sleight of build or is his neck just a bit narrow? Bird Song is 16 hands, which honestly shocks me. Not just given the sireline, but because he always looked bigger than that on the track. mariasmon wrote: Bird Song is 16 hands, which honestly shocks me. Not just given the sireline, but because he always looked bigger than that on the track. He is related on his female side to Birdstone, the littlest horse that could. This is true. I have no idea whether Bird Town is small like her 1/2 brother or not. Trap Game, full brother to Oxbow and Awesome Patriot, standing his first season at stud in 2018 at Rancho San Antonio in the Dominican Republic. Shamalgan, sire in the Czech Republic (photo from last month). Raced all over Europe from age 2-6, stood at stud in France in 2014 and 2015, brought back to the races at age 9 in 2016 and won the Grand Prix of Prague before retiring for good. Trap Game is a very attractive horse. Does it look like he has some ticking in his coat, like Oxbow, or is it just the lighting? He has Oxbow's head, too... wonder if that's the sire or dam stamping them? ETA to answer my own question - definitely Awesome Again's head. Out of curiosity, I took a look at Awesome Again's Stallion Register photo, and I don't see much resemblance. Of course, AA is 23, so comparing his appearance to a youngster like Trap Game is tricky. I was looking at the photos of him & the dam on PQ... http://www.pedigreequery.com/awesome+again I see it mostly in the shape of his head, rather refined, and the eye. 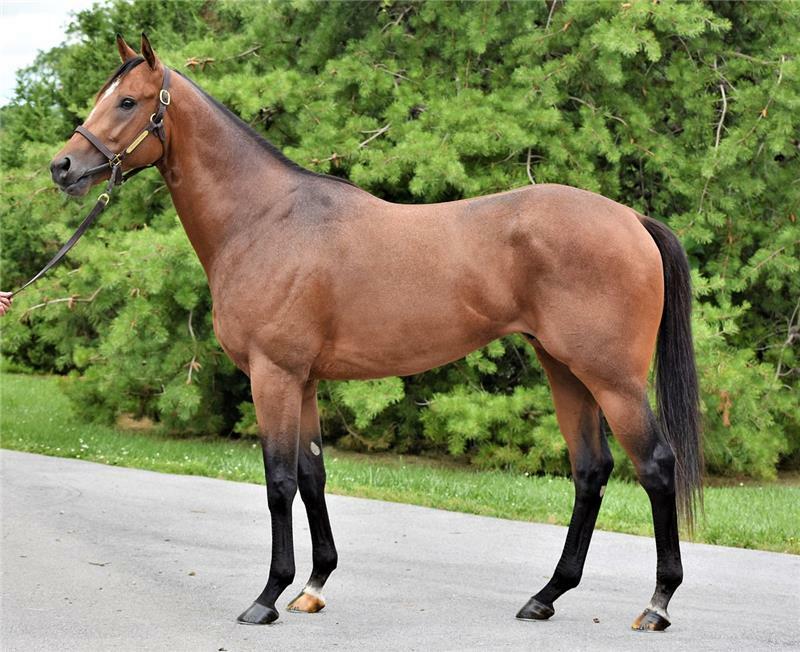 Of course the dam's photo is as a yearling, and a bad angle, so I didn't have much to work with. Gun Runner is absolutely plain in every way, with some long legs. I would never look at that horse and think multiple G1 champion. Classic Empire looks very... stiff. I do not like how he is put together. Dortmund is a nice looking horse. Mr Z's pasturns are scary, but the rest of him may look better as he fills out. I thought Gun Runner was tremendous in person. If it were between him and Arrogate, I'd pick him every day and twice on Sunday. mariasmon wrote: I thought Gun Runner was tremendous in person. If it were between him and Arrogate, I'd pick him every day and twice on Sunday. I agree that Gun Runner is much better looking (and a prettier runner) and even seeing them on TV compared to each other at BC Runner was a better-looking horse. Which is why I'm surprised he looked so ordinary in that picture and made my comment. Charlie wrote: Gun Runner is absolutely plain in every way, with some long legs. I would never look at that horse and think multiple G1 champion. Just curious - did you ever see Gun Runner in person - up close and personal? If so, and you can still agree with what you wrote, well..... oh, never mind. There was nothing ordinary about his conformation photo. No I haven’t seen him in person, and yes he does look ordinary in that picture. That’s not a knock against the horse. I love Runner and Im a huge fan. But he looks mighty plain and average in that picture. I haven't seen him in person, but I've been impressed with photos and video of Gun Runner. I'd also pick him over Arrogate - who I think is very typical of an Unbridled's Song... and for me, that's not a good thing. Kobe's Back is a Pretty Pony, even if he seems a bit long in the back to my eye. Bradster is nicely balanced, although he's so filled out he looks like he's been standing at stud for years. Bradester is beautiful. I don't really care for Kobe's Back, although he is a lovely grey color.